Add 10% to any O2 Recycle order with code SORRY10. Found when site was offline, came up as an incentive to come back. Thanks. I am looking to get rid of my old Pixel 2. I also noticed they are giving an extra £100 top of old phones if you take out a contract on the P30 or P30 pro. Simply enter promo code 5RECYCLE to the checkout to get an additional £5 added to your recycle order. Get an extra £5 cash when you trade in a working mobile phone. Not really, well to be honest maybe a little bit I don't mind fooling around now and again, having a bit of a laugh etc, anyway I initially read the post in a bit of a rush and foolishly thought that it meant they gave you £5 for any phone, I've had a proper look now and I stand corrected, sorry for any inconvenience I've caused you for you having to ask me questions regarding my intelligence ! They're offering me £40 for my old galaxy note 3, I could easily sell it for 3x that on Ebay or CEX even. Promo code: TABLET50OFF -£29.99 Remove Code Total cost £30.00 upfront £50.00 monthly it Does work i Have £29.99 off Up Front Costs on Monthly Payment. Hmm... it doesn't work on any order I try. It always shows "This promo code can't be used with this order. Remove it to continue." Can you post an example deal? I'm mostly interested in paying for the device up front but it doesn't even work on pay monthly deals for me. :-/ If it's O2 Refresh, it might be a good deal. Don't bother trying it on S6, S7 or A3. Not recognised. ​O2, sorry. Title fixed now. Who use Uber these days? it is all about bikes! On the app yes, not sure on website. Any way to find out estimate of fare? Called O2 and they said they are offering 10% off accessories. purchased online use code Sevice10 Shared Via The HUKD App For Android. Got this code in a sms from o2 today so its still active. O2 accessories prices are hiked up by atleast 20% anyway. So not worth it even with code. Better off on ebay. 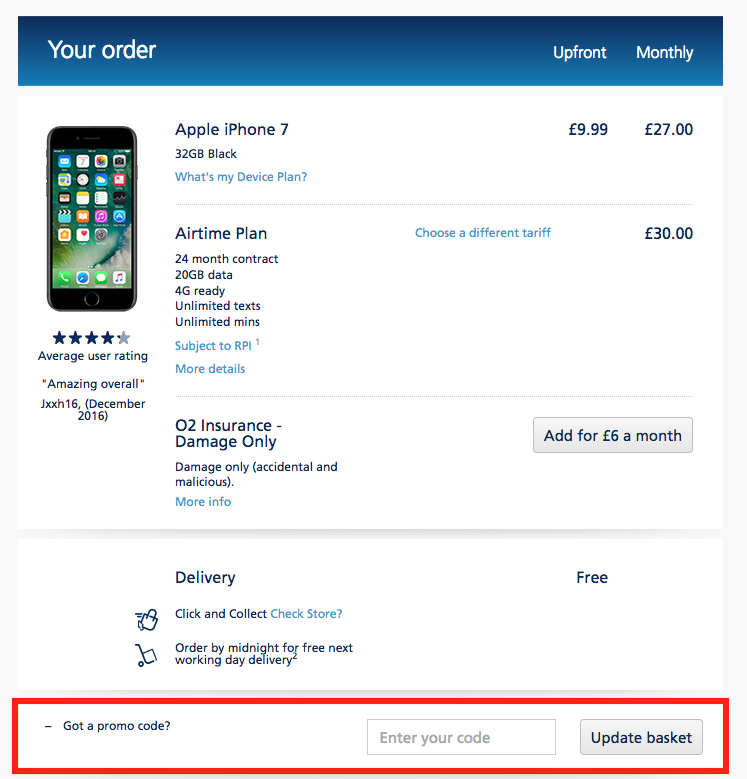 On the O2 website, simply select the item that you wish to purchase, choose a tariff if appropriate and "Go to basket". At "Your basket" you’ll see an overview of an order and the option "Got a promo code?" "Enter your code" in the appearing field and choose "Update basket". The sum should be updated according to the value of your voucher.